Cold and snowy? That means it’s time for chili! Spicy and hearty = warm. But why go for the same old same old? Today we’re using lamb and lentils – two ingredients that pair extremely well. You don’t often see them in chili, but why not? Both play beautifully with spice. 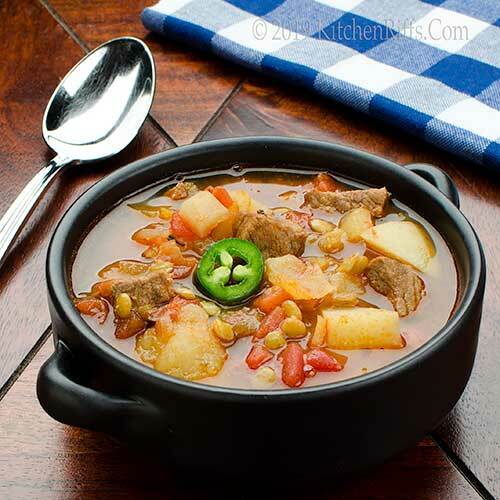 This chili would make a terrific main dish for your Super Bowl party. It’s something most people won’t expect, so it can be your own personal trick play. Sounds like a touchdown in our book. We’re making this dish with leftover cooked lamb (a shoulder or leg roast is ideal). But you can make it from uncooked lamb if you don’t happen to have leftovers (see Notes). If you don’t have a supply of chilies on hand, you can buy poblano or Anaheim chilies from the supermarket. For instructions on roasting them, see the Procedure in our post on Pulled-Pork Green Chile Chili. Or you can skip the roasting and just use canned green chilies. You generally can find these (including canned Hatch chilies) in the Mexican section of most supermarkets. Prep time for this dish is about 15 minutes (plus you’ll need time to roast the chilies if you don’t already have them on hand). Cooking time adds about an hour, most of it unattended. This recipe yields about 8 servings. Leftovers keep well for a few days if refrigerated in an airtight container (or you can store them frozen for weeks). Cut the leftover cooked lamb into bite-size chunks (maybe ½-inch square). Set aside. Peel the onion and cut it into thin slices or dice of about ½ inch. Set aside. Peel the garlic and slice it thinly or chop it into fine mince. Set aside. Wash the jalapeño peppers and cut them lengthwise. Use a teaspoon to scoop out the ribs and seeds (the oil on these is hot, so be careful). Chop the peppers into very small dice (you may want to reserve some slices for garnish). Set aside, then wash your hands with soap and water to remove any hot jalapeño oil from your skin. Scrub the potatoes and peel them (or not; sometimes we leave the skins on). Cut the potatoes into dice of about ½ inch. Set aside. Place a large stock pot or Dutch oven (one that holds at least 4 quarts) over medium stovetop heat. When the pan is hot, add the olive oil. When the oil is heated (it’ll shimmer; about 15 seconds), add the chopped onion and season with salt. Sauté until the onion is translucent (about 5 minutes, perhaps a bit longer). Add the chopped chilies (including the diced jalapeños) and the garlic. Sauté for about one minute. Add the diced potatoes and the lamb pieces. Add the cumin, coriander, oregano, and chile powder. Stir to combine all the ingredients. Then add the diced tomatoes, chicken stock, and dried lentils. Bring the mixture to a simmer and set a timer for 10 minutes. When the timer goes off, taste the chili and adjust seasoning if necessary. Then cook for an additional 50 minutes. (The chili will be ready after an hour, but you can cook it longer if you prefer). Serve, garnishing each bowl with a slice of jalapeño pepper if desired. Like more garnish on your chili? Try some diced onion or shredded cheese. Or a dollop of sour cream. Exact quantities aren’t critical in this recipe. In particular, you may want to use more meat than we specify. Leftover roast lamb (especially from the leg or shoulder) is ideal in this dish. But you if don’t have leftover lamb and want to use fresh, here’s how: Use about 1½ pounds of lamb (you can use ground, or lamb leg or shoulder). If using leg or shoulder, cut it into pieces about ½-inch square. Then brown the lamb in the stockpot or Dutch oven that you’ll be using to cook the chili. Remove the lamb pieces, then proceed with the recipe. If you don’t have green chilies on hand (or don’t want to use them), you can substitute 2 to 3 tablespoons of chile (not chili) powder. (We do recommend including some jalapeño peppers in that case). Remember, chile powder – with an e – is made from dried chile peppers. Chili powder – with an i – contains chile powder plus other seasonings (usually cumin, coriander, and oregano). Ancho chile powder has good flavor, but isn’t all that spicy. So that’s a good one to use if you’re not into hot. We often use dried Hatch chile powder, because we like spicy. Dried lentils cook in 20 to 30 minutes, so no need to presoak them. We use the regular brown lentils in this dish, although you could use another variety if you wish. Kosher salt is less salty by volume than regular table salt (the crystals are larger, so they don’t pack a measure as tightly). If substituting regular table salt, start with about half as much as we recommend. But always season to your taste, not ours. “Mutton ventured, mutton gained,” I said. “Another serving coming up in two shakes of a lamb’s tail,” I said. And I’d have to go on the lam. Yes, it's freaking cold over here and I NEED some of this comforting, delicious and warming chili!! Hi Angie, you do need this. You DO! :-) Thanks for the comment. I am not a sports fan, is it Super Bowl time lol? But I do love a great chili and it is FREEZING in my part of the world. I really like the use of lamb hear, looks fantastic. Hi Evelyne, we're really not football fans, although we DO like Super Bowl grub. Freezing here, too. And although leftover lamb is really good just as it is, it's terrific in this chili -- worth a try. Thanks for the comment. Lamb is so good, but often overlooked in dishes like chili. This sounds like a great idea, and flexible in how spicy-hot to make it. I'd definitely call this a touchdown! Chili is always a great idea, especially during the Super Bowl! Hi Mae, we LOVE the combo of lamb and lentils. Usually cook lentils as a veggie-type side to accompany roast lamb, but this is a different and fun way to combine the two. Thanks for the comment. Hi Kelsie, chili is often our answer to "What's for dinner?" :-) Thanks for the comment. I would’ve never thought to put these ingredients in chili but bet it’s absolutely delicious! Hi Ashley, definitely an unusual combo, but a good one. :-) Thanks for the comment. This reminds me of some meat soup (lamb) that we ate in Iceland. After a cold day hiking on a glacier - it was a tremendous treat. Thanks for the recipe - I'll give it a try! Hi Tricia, worth making a lamb roast just so you can make this with the leftovers. :-) Thanks for the comment. I can't seem to get warm this morning. I would very much a big bowl of this lush lamb chili. A fabulous array of warming spices and hearty fare. Fighting the cold with such dishes is surely the best part of winters! My family loves lamb, can't wait to surprise them with this spicy version! What?! How have I never experienced this flavor combo before? It sounds fantastic! Thanks for adding another great soup to enjoy in our winter wonderland here in Colorado. Brilliant. Oooh, lamb for the hubby, lentils for me! Sounds like we'd both win. And though we had a winter weather reprieve today, it sounds like some frigid air is coming our way again---so something hot and spicy for dinner is perfect. 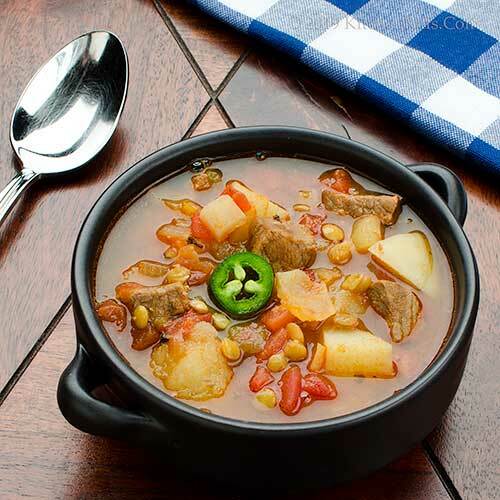 Hi John, somehow I have never made stew with lamb, but I am loving the chili with it...looks delicious and packed with flavors, indeed a comfort dish...thanks for the recipe. Hi Deb, this will definitely warm you up! :-) Thanks for the comment. Hi Lola, your family will love this! Thanks for the comment. Hi Judy, this is a superb combo of ingredients -- love how lamb and lentils play so well together. :-) Thanks for the comment. Hi Liz, temperatures falling here, so they likely will be where you are, and soon. This is the perfect antidote. :-) Thanks for the comment. This sounds delicious and looks fabuous! Hi Juliana, lamb works really well in chili! :-) Thanks for the comment. Hi Anne, it's really good stuff. Perfect for fighting the weather we've been suffering through. :-) Thanks for the comment. A big hello from the sheep country where every media outlet is extolling its flavours and 'must use or you are not Australian! 'with Australia Day Long Weekend just a couple of sleeps away. Well 'chili' may arrive on our doorstep as 'chilli' and not as one of the most popular dishes, summer or winter - but loving lentils as much as I do methinks this will be trialled in a hurry even in our 40C heat :) ! Oh, mutton is most delightfully gamey but hard to buy even here . . .
Hi Eha, truth be told, we'll happily consume chili no matter what the temperature! I totally forgot that Australia Day is this weekend -- this would be such a fun dish for that. Even though your temperatures will definitely be blazing hot. Thanks for the comment. Very innovative. My husband would be so happy if I made this for him--he LOVES lamb. Hi Dahn, more for you if hubby doesn't like it. :-) Thanks for the comment. Hi Sherry, with all the spices in chili, NOTHING can smell rancid! :D Thanks for the comment. Hi Rocquie, we're real lamb fans too. :-) Thanks for the comment. Sherry - it so depends on one and one's friends and the restaurants one frequents - I have not had or been served 'chilli' for years tho' the herb is used in its many varieties almost every day: I guess we are a very SE Asian, S Asian , Middle-Eastern and N African 'mob' besides having been born in Europe :) ! A very hot Oz day . . . Fran just posted 43C for them tomorrow and almost as much for me . . . best . . .
You are the master of great puns! And great ideas for chili! I love that you used lamb and lentils for this! Must give it a try! Such great timing, I organized my pantry and found a box of beautiful puy lentils. Lamb sounds perfect. Hi Natalia, yup! :-) Thanks for the comment. Hi David, lamb and lentils make an excellent chili! Definitely worth a try -- bet you'll like. :-) Thanks for the comment. Hi Vicki, it's been COLD!! At least most of the ice and snow is gone, so we can take our daily walks (more like treks, really). And then come home to a big bowl of this to warm up! Thanks for the comment. Hi Lea Ann, lamb and puy lentils are SUCH a natural pairing. Those lentils have such an interesting flavor, don't they? Anyway, thanks for the comment. John, what a perfect dish for winter! You and I are on the same wavelength this week with lentils and chiles. Hi Jean, it's a great wavelength to be on! :-) Thanks for the comment. My lamb loving husband would be thrilled if I served him this! this is a dish I have got to try. I have never thought of pairing green chile with lamb. Of course I love both ingredients, but haven't brought together and certainly not with lentils. What a great recipe John! Thanks for sharing! Hi Pam, you should be a lamb and serve this to him. :-) Thanks for the comment. Hi MJ, this dish has your name all over it! You'll love it. :-) Thanks for the comment. This is fabulous, John. Except for the fact that my husband claims that he dislikes lamb. He's forgotten that one Easter when I stuffed a leg of lamb with dried fruit, and quite a few other lamb meals. What an exciting new spin on chili...which always goes over well in my house. What an interesting combo of ingredients. Can't wait to have a warm bowl of this! Hi Mimi, no need to tell him there's lamb in this. :-) Thanks for the comment. Hi Abbe, isn't this a neat recipe? Really. Good. Stuff. :-) Thanks for the comment. We love lamb and lentils and the two together are brilliant! Great idea! We also love your idea of roasting all your chili peppers together at one time and freezing them in little packets. We are so doing that this year. Wishing you a super weekend! Hi Bobbi, it's work to roast all the chile peppers at once time, but of course they ripen at one time (if you're using Hatch chilies, that is!). Thanks for the comment. 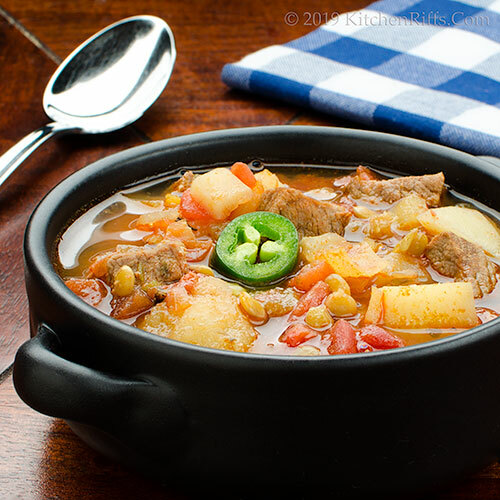 Such a great comforting dish on this chilly day! This sounds so wonderfully spiced and flavored. I've been on a chili kick, and we've had it twice this week. I used pork once an I'm loving the idea of lamb even more. And any time I add roasted chiles to a dish I'm so happy I did. Stay warm! Hi Denise, it's COLD here! Need. More. Chili. :-) Thanks for the comment. Hi Valentina, pork is great in chili! And do try the lamb -- it's a nice change. Thanks for the comment. I always enjoy trying new chili flavors and ingredients. This looks delicious for sure!! Perfect for these cold snowy days, too. Hi Amy, for fun flavors to beat the cold, this recipe can't be beat. :-) Thanks for the comment. Hi Taruna, not cold there at all, but chili is always welcome, yes? Thanks for the comment. This does sound like a great tasting chili John, I've had lentils with lamb sausage and know it makes a good flavor combination. Hi Karen, lamb sausage! I haven't had that for ages. Gotta get me some -- and serve lentils with it. :-) Thanks for the comment. Cumin is so glorious on lamb. This looks like the perfect dish to tuck into on a winter night with some good crusty bread alongside. Hi Carolyn, crusty bread would be great with this! Thanks for the comment. Your chili brings back memories of eating lunch with some Hispanic workers. They had a large pot of chili/stew with similar ingredients, except the protein was a goat. We'd grab a fresh homemade tortilla and place some meat and potatoes in it and eat it like a soft taco. I have a lamb should in the freezer that I've been waiting to be inspired to use. Your chili sounds perfect for my lamb shoulder. I now have a sheepish grin on my face as I anticipate eating this chili. It is cold but not snowy here! Nevertheless, I wouldn't say no to this chili! Looks yummy! Hi Ron, goat is good! Hard to get in most of the US, though -- lamb is much easier. And yes, you need to have this -- if for no other reason because of your excellent pun. :-) Thanks for the comment. Hi Katerina, it's very yummy. :-) Thanks for the comment. I was planning to make a bean chili for this weekend. I love the idea of using lentils! I'm adding that to my plan. Hi Lisa, lentils are terrific in chili! Their deep, earthy flavor really works well with the spices. :-) Thanks for the comment. This sounds wonderful, especially for a cold winter day. I love lamb stew, but I've never made it, so thanks for the recipe! I really like the idea of putting potatoes in the chilli, and using some leftover lamb. Hi Jeff, it's really cold here, so we're going to pull some of these from the freezer tonight! :-) Thanks for the comment. Hi Caroline, potatoes are wonderful in chili! :-) Thanks for the comment. The cold and snow too is horrendous here and the wind... Anyway, this chili would be perfect for the weather. I've never had it with lamb but would try it. Stay warm! Hi Pam, really cold here, too. Not too much snow, thank goodness! We're having this again for dinner tonight. :-) Thanks for the comment. Okay, I am obsessed with the name of this dish and the flavors! I love spicy soup dishes. Hi Laura, fun name, huh? :-) And wonderful flavor! Thanks for the comment. John, I don't really ever make lamb at home, but that may be about to change. This chili sounds seriously good!! In case I can't find lamb, would subbing beef stew or pork work? Your spice combination sounds amazing and I totally added this to my "must try soon" list! Hi Marcelle, we haven't made this with beef or pork, but I don't see why it wouldn't work. Or goat would work, too. :-) Thanks for the comment. This chilli sounds wonderful, perfect for a rainy day. Hi Gerlinde, it's really nice -- terrific flavor. :-) Thanks for the comment. John, I was browsing through your site and came across this fabulous chili! It looks fantastic! 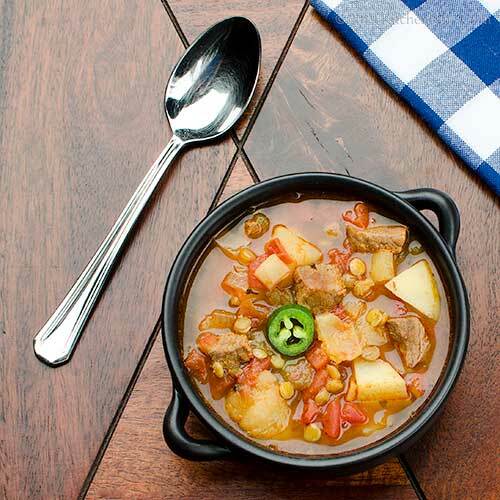 We love lamb stew and with the potatoes and green chilies, this one's a real keeper! Hi Kelly, there's lots to browse through! And this is a winner -- lamb makes terrific chili. :-) Thanks for the comment.